Legends Outlets is home to some of the best shopping, dining, and entertainment in Kansas. 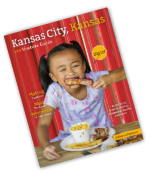 Sporting KC, AMC Theatres, and Arthur Bryant&apos;s to name a few. My daughter and I spent a gorgeous day exploring some of what the Legends has to offer fun seeking adventurers like us. 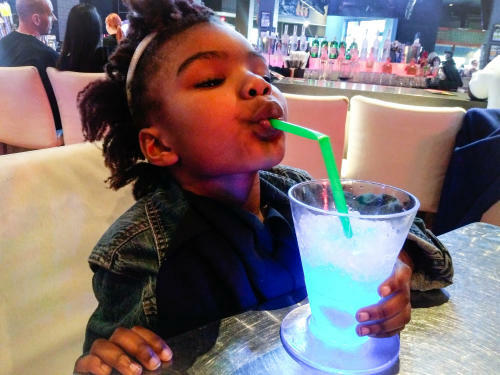 Our first stop was Dave and Buster&apos;s Kansas City, a quadruple threat in the form of a restaurant, arcade, sports bar, with a rooftop event space. The menu has a variety of Eat & Play combos that were just too good to pass up. I selected the Dynamite Fried Shrimp and my daughter chose the Classic Goldfingers (chicken strips). 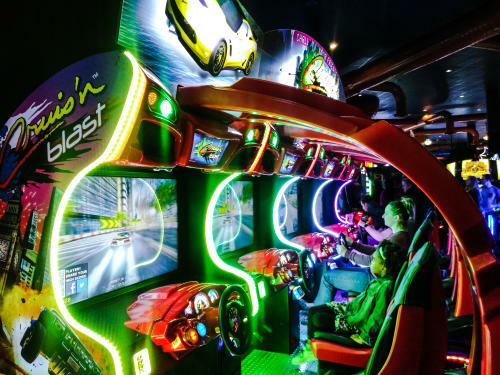 Each dish on the Eat & Play menu comes with a side of game time! Power play cards are loaded with a credit of $10 or $20 for some after dinner arcade fun. 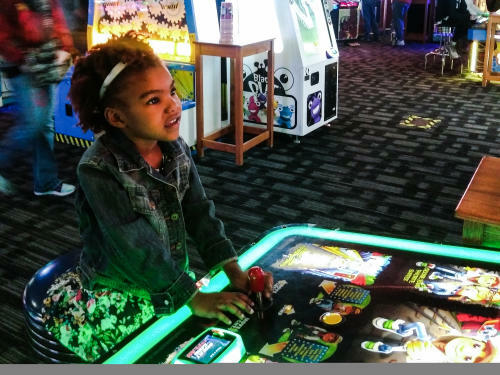 We opted for the Eat & Play with $20 Power Play cards to get the most out of our arcade fun. But before any game play happened, we sat down for a tasty meal. 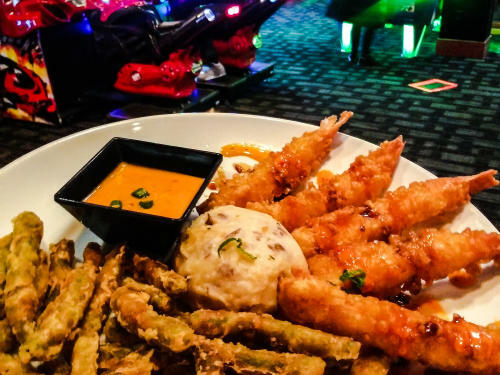 Dave & Buster&apos;s Dynamite Shrimp is an explosion of Asian inspired flavors. The shrimp are coated in crunchy panko bread crumbs and fried to a golden crisp. Then soy sauce and a spicy chipotle aioli are drizzled over the top. It comes with sides of tempura green beans and garlic-ginger mashed potatoes. The Classic Goldfingers are a generous plate of juicy tender strips chicken. They&apos;re served with a heap of savory french fries. With our bellies full of delicious food, it was game time! Dave & Buster&apos;s arcade room is a good mix of old school games and what the kids are playing today. Think classics like Pac Man and Skeeball being played next to Candy Crush and VR simulations. My daughter&apos;s top picks were Grand Piano Keys and Fruit Ninja. We also played several rounds of free throws. A few hours flew by and we were ready for more exploring. Off we went to take in some legendary local views. The Legends Outlets complex was designed not only as a premiere destination for shopping and entertainment but also as a tribute to the significant contributions of Kansas citizens to American history. Take a stroll throughout the courtyards and you&apos;ll discover memorial statues, murals, and art installations dedicated to a historical Who&apos;s Who of Kansas. Our favorites were of Amelia Earhart and her plane. Earhart, born in Atchison, KS, was the first woman to complete a solo flight across the Atlantic Ocean. Another favorite was of an athlete running in a race. Three Kansas natives have set world records in 1500 meter runs, Glenn Cunningham, Wes Santee, and Jim Ryun. 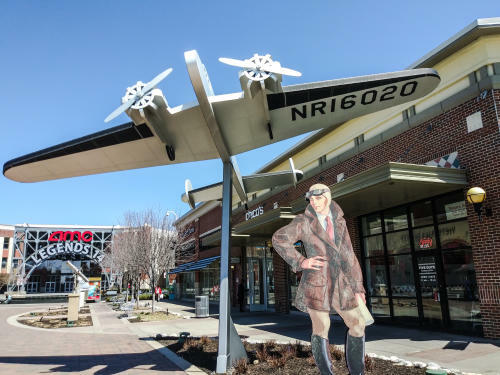 The Legends Outlets showcases a myriad of important Kansas figures in the fields of athletics, science, politics, art, and more. It was a treat to get a lesson in Kansas history while enjoying a fun night out. And speaking of treats, I have a major sweet tooth which means no adventure would be complete without dessert! We ended the night at sweetFrog Frozen Yogurt. 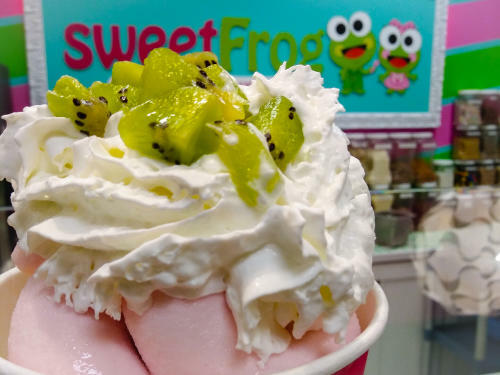 At sweetFrog the possibilities for yogurt combinations are almost endless. The flavors are deliciously unique as well. I was like a wide eyed little kid when I saw flavors like passionfruit-orange-guava and huckleberry. We decided to keep it simple though and opted for "birthday cake" and "lemon". 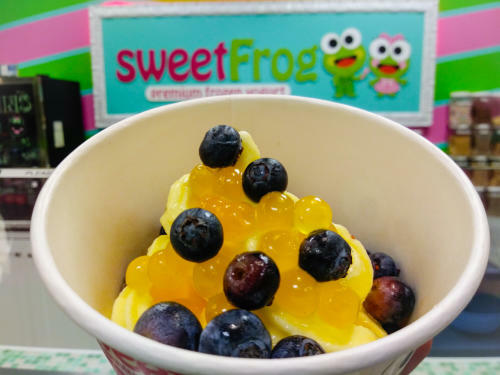 sweetFrog also has lots of choices for toppings which let you get in touch with your creative foodie side. I filled the bottom of my cup with coconut flakes, chewy chunks of mochi, and walnuts. Then I piled on the birthday cake froyo and topped it with diced kiwi and whipped cream. My daughter usually goes for lighter flavors. She chose lemon froyo with a heap of blueberries and mango boba. On that sweet note our Legends adventure came to an end. 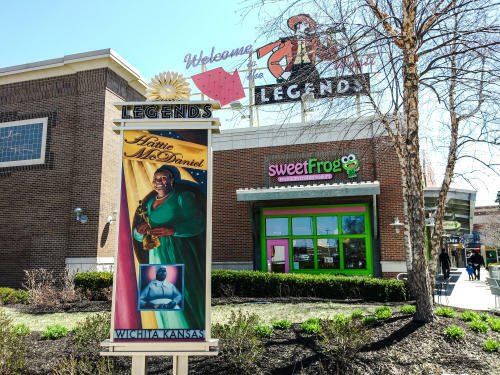 With dozens of shops, restaurants, and entertainment, the Legends Outlets offers an amazing day or night out for everyone! 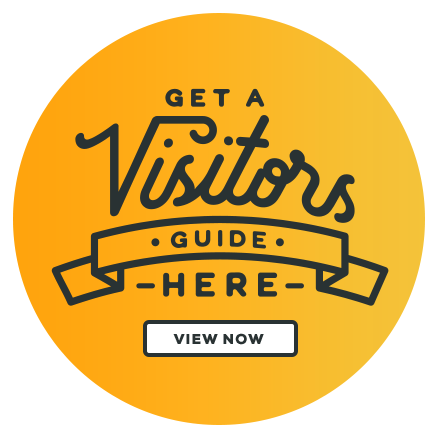 Don&apos;t miss out on a single blog! Sign up for our monthly blog e-mail here.